Last October, Texas education officials told lawmakers they would likely owe the federal government $33 million for illegally decreasing funding for kids with disabilities. They reassured them it was a fraction — just 3% — of their federal special education grant and wouldn't hurt students. Now, the state's estimate for how much it could owe has risen to $223 million, nearly a quarter of Texas' annual special education grant, officials confirmed to The Texas Tribune Friday. That total includes an estimated $111.6 million it may have to pay back for failing to spend it on kids with disabilities this fiscal year. "It's good that we're becoming aware of [these violations] now, even late during this legislative session, because there's an opportunity to amend the state budget to account for the loss of federal aid," said Steven Aleman, a lawyer and advocate at Disability Rights Texas. "But the opportunity to bring even some degree of resolution is closing. It would be best if the state could resolve the entire issue, because otherwise we will be in a perpetual situation of having to address shortfalls." "The primary objective of the discussions in progress is to ensure that special education services for students are not negatively impacted," said DeEtta Culbertson, a TEA spokesperson. The issue is tied to a major flaw in the way Texas chooses to spend money on kids with disabilities. Texas "weights" its funding for kids with disabilities, paying schools more to educate kids who have more severe disabilities or need more personalized attention in the classroom. The state's lawyers unsuccessfully argued at the Fifth Circuit Court of Appeals last year that it decreased spending on kids with disabilities in 2012 because students just didn't need services that cost as much. A panel of Fifth Circuit judges bluntly opined in November that Texas' system "creates a perverse incentive for a state to escape its financial obligations merely by minimizing the special education needs of it students." "This amendment is one step in addressing the state's shortfall with respect to special education funding," Gonzalez told the Tribune Friday. "In order to ensure a complete process, we need to put more money towards our students who need special education services, and make sure that those who need services have access to them." But getting the money to schools would also require additional appropriations. Any additional spending tweaks House lawmakers want to make must be ironed out in conference committee negotiations toward the end of the session, said the House's lead budget writer Rep. John Zerwas, R-Richmond. 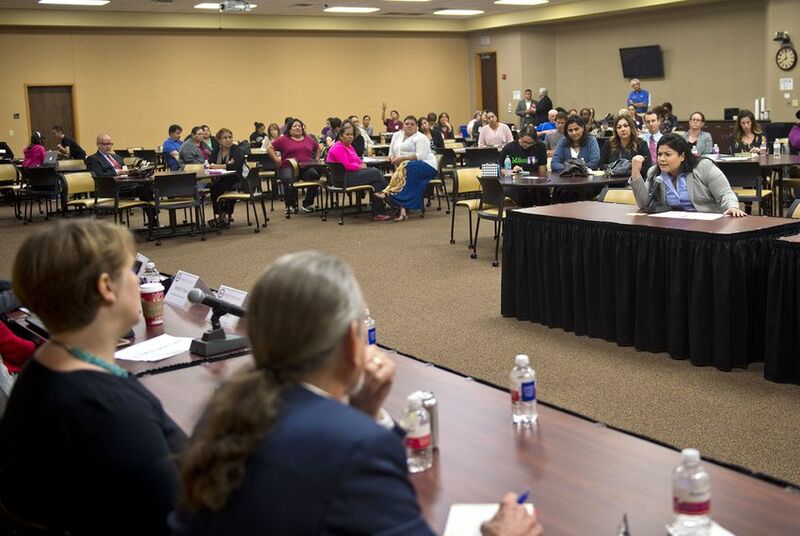 Education officials say they have followed federal requirements to overhaul special education, allowing them to "improve the standard of service to students with disabilities across Texas." "The loss of federal aid because of the state's failure to spend at the appropriate level will directly affect agency operations and efforts to bring the state into compliance with the federal investigation, but more importantly would also affect the availability of services at the local level by putting even more of a burden on local tax dollars to pay for services," Aleman said. "Any shortfall in federal aid because of a state violation needs to be made up by the state."